Sofia Gubaidulina is a composer from the inner reaches of the far out. Her work can inhabit extreme worlds of timbre and veer off on eccentric tangents, but there is also a deep conservatism with roots in the Russian tradition of Shostakovich and the music of Bach. So much was apparent from her Composer Portrait from Miller Theatre, presented by the International Contemporary Ensemble (ICE) at the Isabella Stewart Gardner Museum on Thursday night. This group of touring New Yorkers performed four Gubaidulina works dating from between 1980 and 1993: a narrow slice of the 81-year-old’s six decade career, but nonetheless an exciting and enlightening look at her chamber music. Calderwood Hall’s theater-in-the-cube was arranged like a four-ring circus with a different setup for each piece in a different corner of the stage ready to go from the start. The first piece was a string trio (1989) performed by David Bowlin, Kyle Armbrust, and Michael Nicolas. This work, in three movements, served as an introduction to elements of Gubaidulina’s writing that would show up throughout the evening. She frequently uses timbral effects—for instance a feathery repeated high violin slide—that seem divorced from the core musical content going on in other instruments below. Another Gubaidulina specialty is an obsessive fixation with a single repeated fragment, note cluster, or single pitch, which is how the first movement of this trio began. The second movement then was a foray into violin and cello pizzicato with some gutsy bowed viola gaining prominence later on. The finale was highly reminiscent of Shostakovich with frantic string writing that would be at home in one of his quartets. 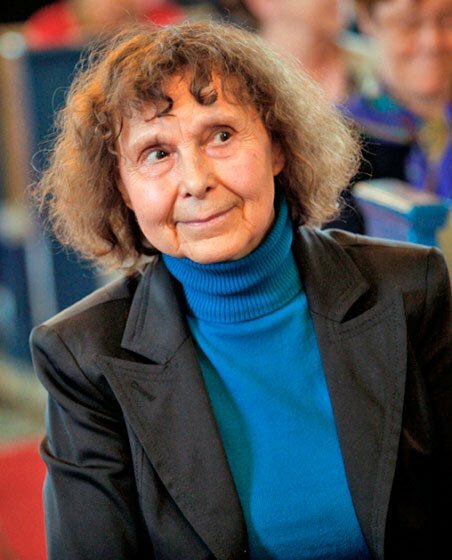 But unlike Shostakovich, whose most popular works draw us into a frightening world, there is often something removed and performance-like about Gubaidulina. In this opening trio, the players, dressed in black, played with rapt concentration while dispatching their notes. But the music doesn’t quite let the listener in: there’s a sense of witnessing something alien from the outside that you have to work to understand. The second piece, Garten von Freuden und Traurigkeiten (The Garden of Joy and Sorrow) (1980), was scored for flute, viola, and harp, and felt very much of its time: a bit of late Cold War ephemera set to spoken angsty German poetry. The text, by Francisco Tanzer, touched on some of Gubaidulina’s metaphysical and spiritual preoccupations concerning the unity of the universe. But despite a fine performance from Armbrust, Eric Lamb, and Bridget Kibbey, and a few interesting features—including bottleneck guitar-style glissandi and a very catchy pattern that briefly emerges in the harp—the piece doesn’t quite stick. Things really opened up with the next work, Quasi Hoquetus (1984) for viola, bassoon, and piano. There is a lot of beauty here and a fascinating mixture of eccentric jagged material and traditional—almost textbook—tonal harmony. This was our one look at Gubaidulina’s piano writing, and she makes good use of both a quick bell-like rhythmic pattern in the treble register and a sonorous tonal sequence in contrary motion between the two hands. This later material is often used as a linking element and is exquisitely woven in and out of a very different modern texture. Jacob Greenberg and Armbrust played beautifully on piano and viola, and Rebekah Heller, featured on bassoon, cracked her notes into intentional multiphonics and had a rich tone and a jaunty, vaguely bebop, quality in other passages. The final work was Meditation on the Bach Chorale “Vor deinen Thron tret ich hiermit” (1993). Scored for a concerto grosso group of strings and harpsichord, this piece is based on a late Bach chorale that is sometimes included as a postlude to Art of the Fugue. One of the most striking aspects of this piece is how Gubaidulina coaxes a true lyricism out of a percussive col legno (with the wood of the stick) technique in the strings. The harpsichord, meanwhile, takes on a kind of neo-Gothic quality in the contemporary context. Toward the end is a lurching accelerando for the whole ensemble, and the shattering quality of this quickening defies description. The piece ends with an incomplete progression of chords in the harpsichord leaving you wanting more.